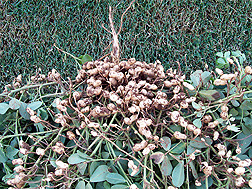 Drought-tolerant peanut yield from full irrigation. Compare to image D1560-1, which shows the yield from the same peanut species grown under deficit irrigation. Peanuts are an important crop, contributing more than $4 billion to the country’s economy each year. But rapid growth in cities along with water level declines in aquifers throughout the South have resulted in fewer acres for farming and less water available for irrigation. To meet future food-supply demands, crop production will have to increase, but it must do so under the constraints of less water and, most likely, less farm land. Agricultural Research Service scientists with the Plant Stress and Germplasm Development Research Unit in Lubbock, Texas, and the National Peanut Research Laboratory (NPRL) in Dawson, Georgia, are working with cooperators to help peanut farmers maintain and improve their production in a changing environment. At the Lubbock laboratory, plant physiologist Paxton Payton and postdoctoral research associate Rao Kottapalli are examining molecular mechanisms involved in peanut response to abiotic stress. Abiotic stress is the negative effect that nonliving factors, such as drought and heat, have on living organisms. 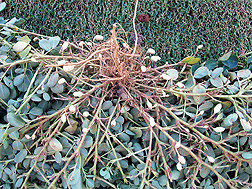 Drought-tolerant peanut yield from deficit irrigation. Compare to image D1559-1, which shows the yield from the same peanut species grown with full irrigation. Even with less water, drought-tolerant peanuts still yielded fairly well. The researchers recently conducted groundbreaking work aimed at linking responses at the molecular level to the physiology and yields in peanut plants. They examined the proteins, particularly their expression, that control drought stress in peanut. To examine diverse peanut germplasm more efficiently, Payton and Kottapalli performed greenhouse and molecular screening of 70 genotypes from the U.S. peanut mini-core collection and 7 additional cultivars representing varieties commonly grown in the southern United States and semiarid regions in Asia. 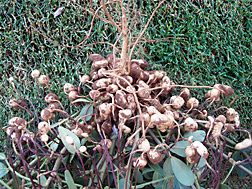 The mini-core collection—developed by ARS plant breeder Corley Holbrook in Tifton, Georgia—consists of 112 peanut accessions that represent most of the variation present in the larger collection of peanut germplasm. Field screening of the accessions was performed by New Mexico State University scientist Naveen Puppala and a team of Texas AgriLife Research and Texas Tech University sci­entists led by Mark Burow. Photosynthetic measurements of the field-grown plants by Payton and Kottapalli helped narrow down the group to two accessions that are highly tolerant to heat and drought and two that are highly susceptible. This follows previous work by the AgriLife and Texas Tech scientists and ARS scientists John Burke and Gloria Burow, who demonstrated heat and drought tolerance in a smaller set of peanut germplasm. They are now examining the inheritance of abiotic stress tolerance and hope to develop molecular markers that can be useful in breeding. Perhaps most importantly, the phenotypes Payton and Kottapalli identified in the screening process were confirmed by field trials under stress-inducing conditions. Puppala and Burow are using the results of this and other screening experiments to make crosses to improve abiotic stress tolerance in peanut. Payton and the researchers are also testing peanut’s response to other abiotic stresses. In recent tests, they found that the most heat-tolerant accessions were also the most drought tolerant. They also plan to build on previous salt-stress work by AgriLife and Texas Tech scientists and conduct low-temperature screenings and tests in the coming year. 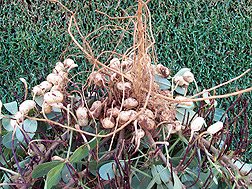 Drought-sensitive peanut yield from deficit irrigation. Compare to image D1561-1, which shows the yield from the same species grown with full irrigation. With less water, the sensitive peanuts yielded about 90 percent less than those grown with full irrigation. NPRL agronomist Wilson Faircloth and plant stress physiologist Diane Rowland (formerly with NPRL and now with Texas AgriLife Research) conducted field trials for 5 years in west Texas to determine the effects of deficit irrigation and, more recently, conservation tillage on peanut performance. It is also during this latter part of the growing season that growers typically experience water deficits due to reduced pumping capacity, further increasing the risk of yield loss. To be sure the research would hold up under grower conditions, the scientists tested it in one half of a center-pivot irrigation system located in Lubbock, Texas. They subdivided it into six half-acre sections and applied varying amounts of water to peanut and cotton planted in either conservation or conventional tillage. 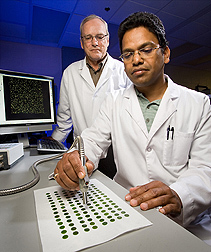 ARS physiologist John Burke and postdoctoral researcher Rao Kottapalli perform a chlorophyll fluorescence assay on peanut leaf samples from irrigated and drought-stressed plants. This assay is one of several that are used to screen germplasm for variability in abiotic stress tolerance. The monitor in the background shows an image of a peanut DNA microarray that is used to identify genes involved in stress response and to compare contrasting germplasm. “We used varying amounts of water to simulate a range of conditions—from normal season-long irrigation to early-season drought to late-season drought,” says Faircloth. Irrigation treatments were done in the traditional manner (meeting 100 percent of the water need) and to simulate early-season drought (50 percent of the full amount for the first 45 days after crop emergence) and late-season drought (50 percent of the full amount for the 45 days before harvest). Soil conditions and plant physiological responses were intensively monitored in the test areas. These included soil water content, plant photosynthetic rates, metabolic fitness, soil and canopy temperatures, rooting patterns, and tissue collections for genomic expression. With more research, ARS will be able to help peanut farmers prepare for changes in the environment, which will help keep this delicious and nutritious legume available for generations to come.—By Stephanie Yao and Sharon Durham, Agricultural Research Service Information Staff. This research is part of Agricultural System Competitiveness and Sustainability (#216), Plant Biological and Molecular Processes (#302), and Quality and Utilization of Agricultural Products (#306), three ARS national programs described at www.nps.ars.usda.gov. "Preparing Peanuts for the Future: New Cultivars and Farming Strategies" was published in the January 2010 issue of Agricultural Research magazine.